I'd like to talk about something that is a new experience for me since we came home on furlough. It's the "car cart" at the supermarket. You know, the shopping cart with the cute plastic car attached to the front for the kids to ride in? I don't bring a camera with me to the grocery store, but I went online to find a photo, just in case some of you don't know what I'm talking about. At the store I loaded up Greg in his little car, and everything was just peachy for about 20 seconds. Then I realized that before I could reach the produce, I had to navigate through the floral department. The store designers had decided to weed out the weak car-cart drivers right at the beginning by littering the entryway of the store with islands of precariously arranged potted plants and bouquets. As I bravely stepped forward, I realized that the car-cart contraption is about as easy to steer as a piano in a wheelbarrow. And there wasn't even a straight path. I had to slalom through the little displays, bumping flowers along the way under the disapproving stare of the floral department employee. Once I passed that minefield, I thought I would be ok. I gamely pushed my cart forward - and went sideways instead, right into the apples. By the time I reached the broccoli, Greg started asking if he could get out. (Maybe he didn't realize that he was getting into a bumper car!). At this point a middle-aged woman commented sympathetically, "Those are hard to steer, aren't they?" I started to reply, but another mom (obviously a professional), glided by easily with her own car-cart and said, "Oh, you get the hang of it." I wanted to shout after her, "I'm new! This is my maiden voyage in a car-cart!" In the next aisle, Greg started to stick his head out the window of his car like a dog going down the highway. He is lucky he didn't lose it as I wove from side to side in a generally forward direction. In the third aisle I realized that the aisle is exactly as wide as the car-cart is long. Thus turning the contraption around is an exercise that requires intense concentration. On the bright side, this was turning out to be a nice workout for a cold and rainy day when I didn't get out for a walk! When I reached the check-out, I discovered another problem. With the plastic car sticking out in front, I wasn't able to reach the items in my cart from in front of the cart. There wasn't enough space alongside the cart for me to stand next to it while I unloaded it onto the belt. So I had to park the car-cart farther back from the belt and walk back and forth until I had unloaded all my purchases, then push the cart through, trying to reach the card-swipe thingy while not allowing the nose of the car-cart to protrude too far into the exit aisle to trip up the customers leaving the store. "Shopping with kids can be a challenge. That's why we offer Bean child carts to make shopping safer, easier and more fun for your customers. With kids sitting pretty in child carts, mom and dad can focus on shopping and spend more money in your store. 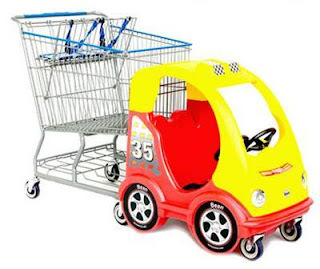 In fact, child carts have been proven to increase sales up to 20% per trip. Kids are able to have fun, mom and dad can focus on shopping, and when your sales are up, you'll be feeling a lot happier." More fun? I'm not so sure on that one yet. I don't know that I'll be trying it again. Before we went home I had to make one more stop at another store. As we crossed the parking lot towards the front doors, Greg looked hopefully up at me and asked, "Have car cart here?"